Today’s picture is another from my brother. 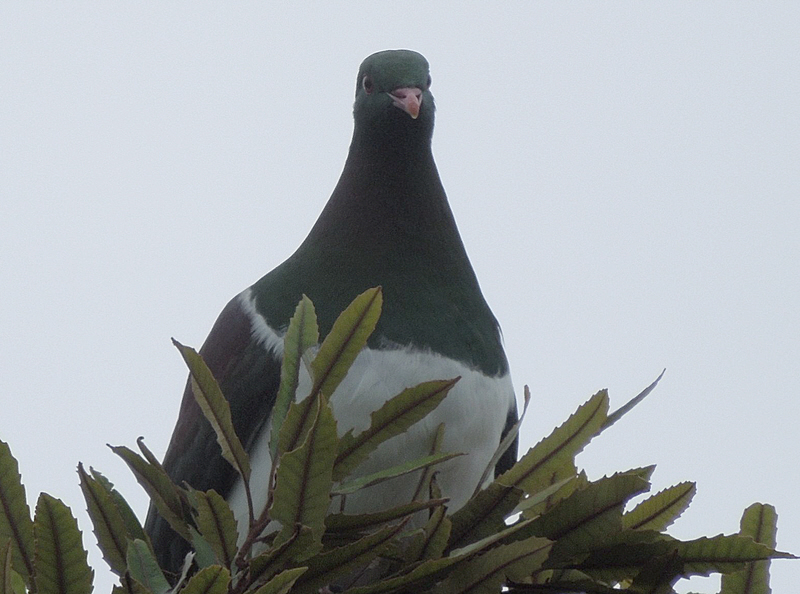 In contrast to yesterday’s hard won crow picture, he says these NZ native pigeons are so fat and lazy that they are easy to photograph. …and then we were off in the Kangoo and a cloud of smoke. A cloud of smoke? That’s not right, we thought and it wasn’t. The car coughed and spluttered, now stopping, now going. We got as far as the High Street and wisely turned into our local garage just as the car gave up the ghost. We were worried that it would prove to be one of those intermittent faults that never show up when a mechanic is near by. We needn’t have worried. He couldn’t get it to move an inch. We were just contemplating the bus timetable when he kindly offered us the use of a car for the day which we gratefully accepted and off we set again. 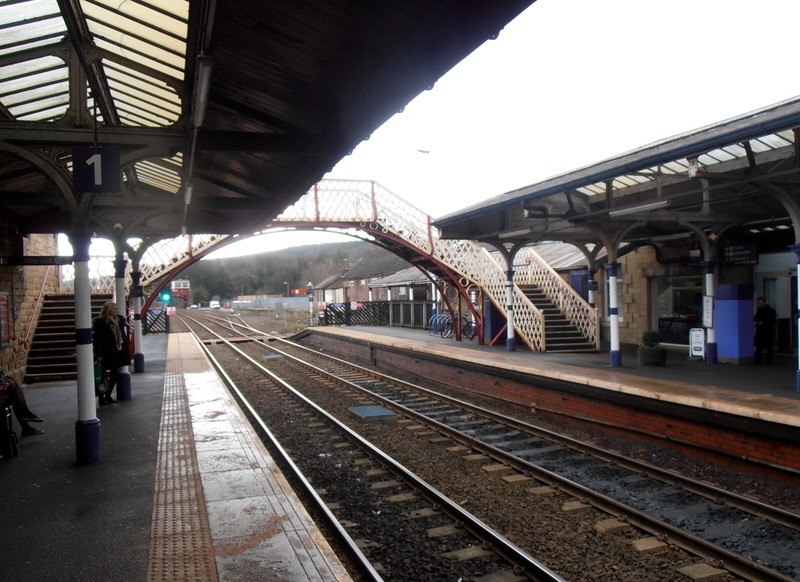 Our plan was to drive to Hexham where there is ample parking and then catch the train to Newcastle. This avoids city driving and expensive parking and turned out to be a very good idea. The parking cost us £2 and the trains were punctual and warm. 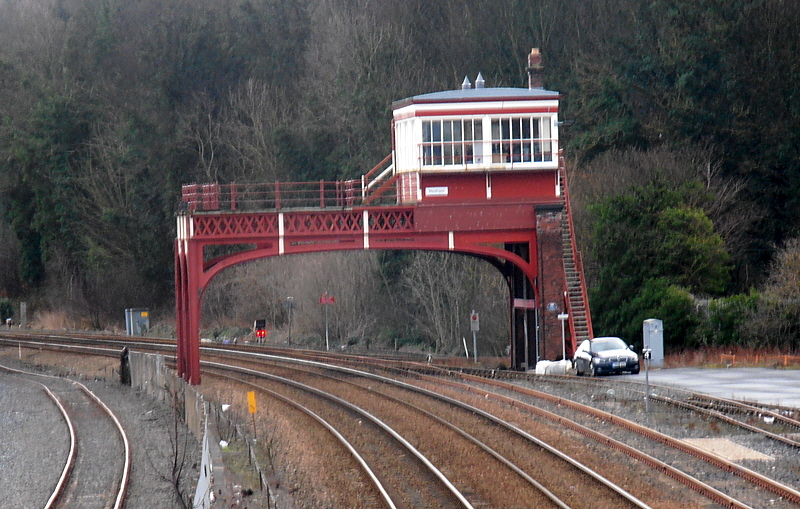 It has an elegant signal box too. 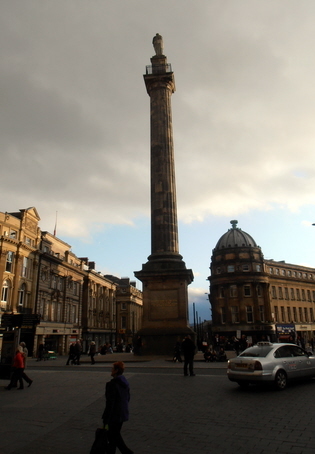 We arrived in Newcastle to find pleasant weather and a busy but not overcrowded town centre. 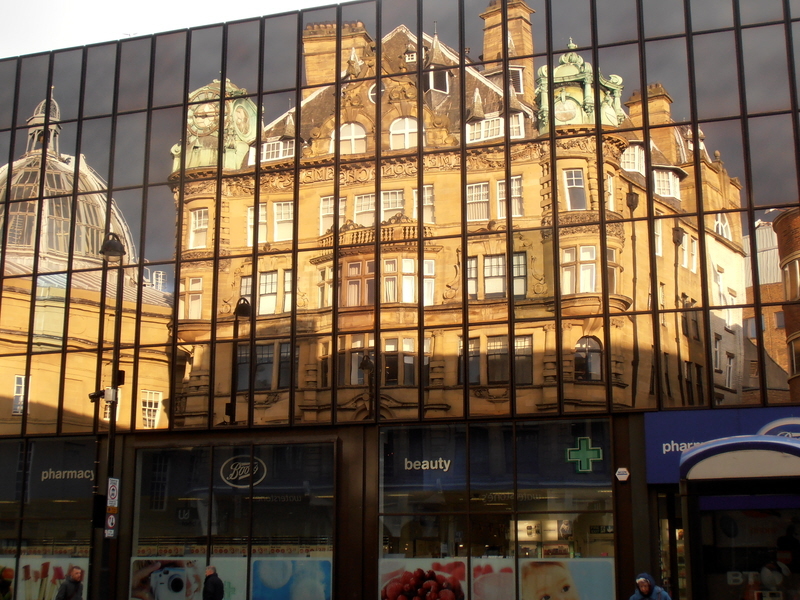 There are many fine buildings in the main shopping area and stone cleaning has changed the whole look of the place. 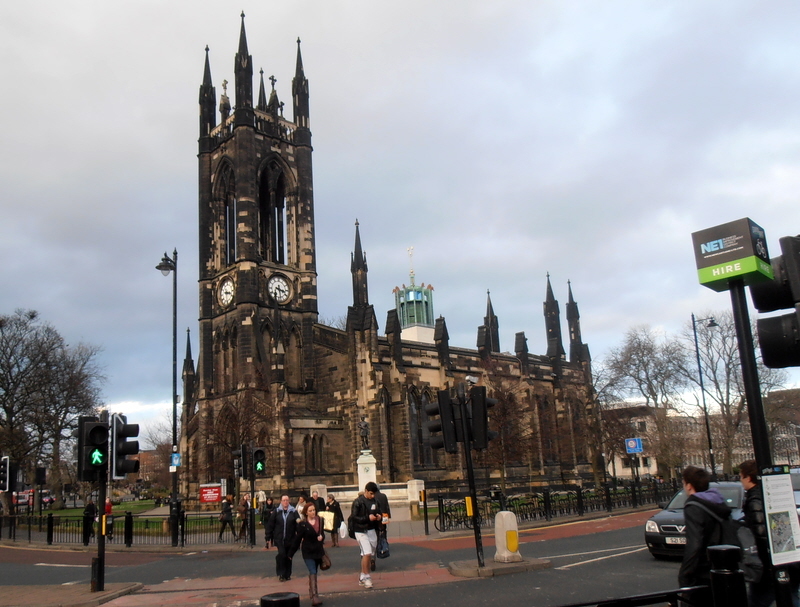 This church nearby gives you an idea of what the soot covered buildings used to look like when I was a boy. We went into an enormous shopping centre as Mrs Tootlepedal was looking for bits and bobs for her embroidery. Not finding what we wanted in John Lewis, we went into their brasserie to have some lunch. I wasn’t expecting much from a department store eatery in a shopping centre but I was very pleased to be proved wrong and we had a delicious lunch in comfortable and elegant surroundings. After lunch we went into another famous Newcastle store and there Mrs Tootlepedal found that her wants were catered for and made several small purchases. These included a pen that doesn’t write and glue that doesn’t stick but she seemed very happy with them. At this stage we encountered the only downside of the whole day. We couldn’t get out. It was a massive shop of many aisles and floors in the middle of an even more massive shopping centre and there was no indication whatsoever of where the escape route might be found. We didn’t panic though and wandered about until we found the ladies perfumery department and then we knew that freedom was near because for some reason, this department always seems to be near the front door of big stores. We were not disappointed and emerged into a sunny street. 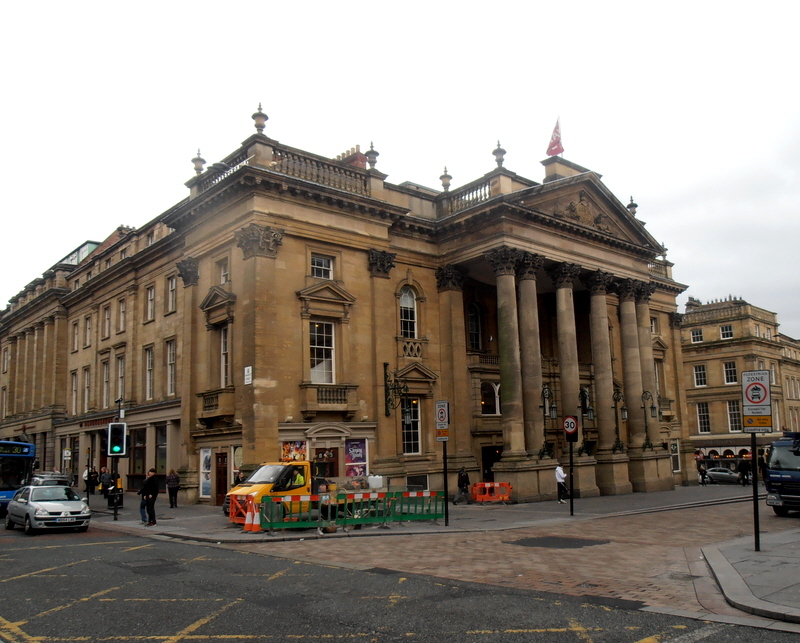 This was the building opposite. The black part is the building opposite. 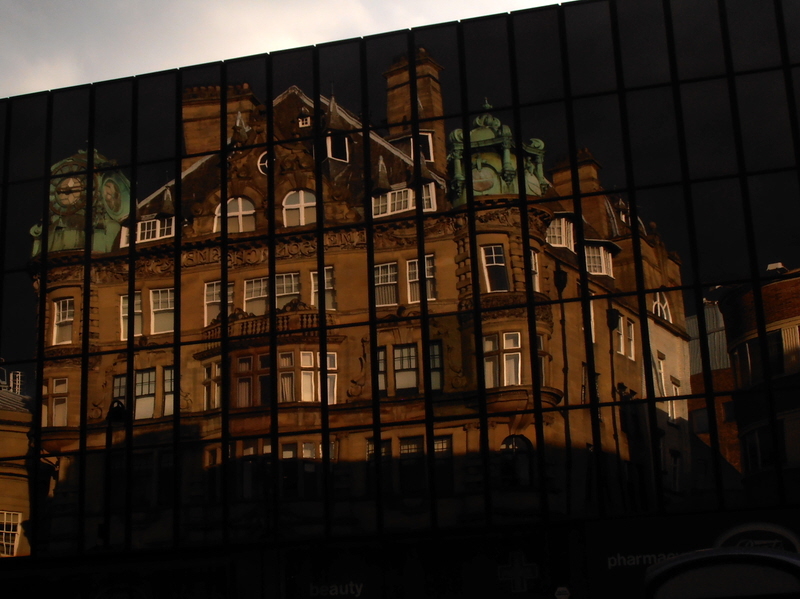 The stone building was behind us and we were looking at a brilliant reflection. Here it is again. The Boots store is part of the building we were looking at. It was quite unnerving until your brain had sorted out what was happening. It makes a contrast to the carefully cultivated contempt for politicians exhibited by our news media today. …but we didn’t notice anyone riding one. 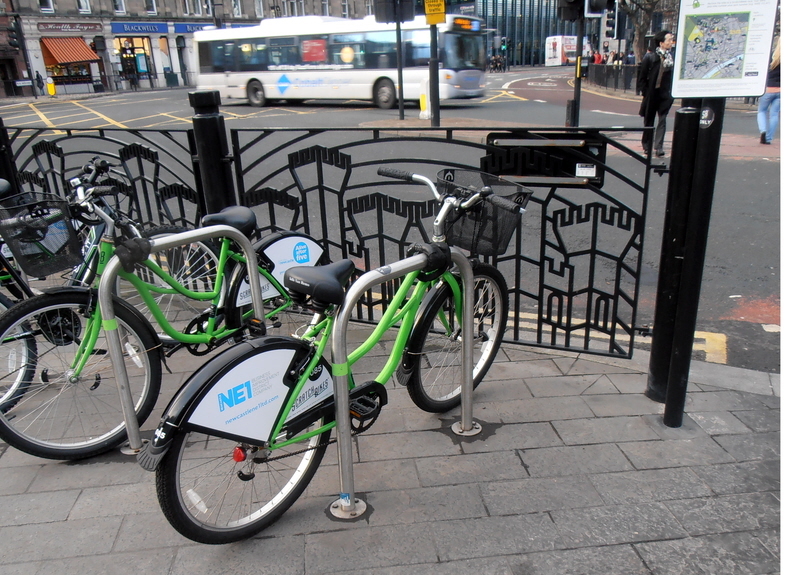 Perhaps January is not going to be a top month for tourist bike hire anyway. 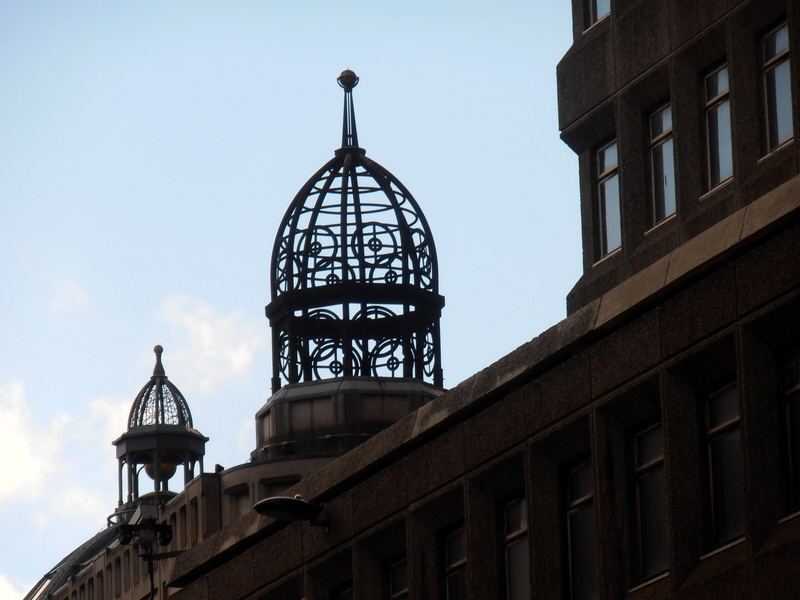 There are many pieces of architectural brutality along side the fine old architecture and I liked these hopeful cupolas perched on top of a big lump of concrete. 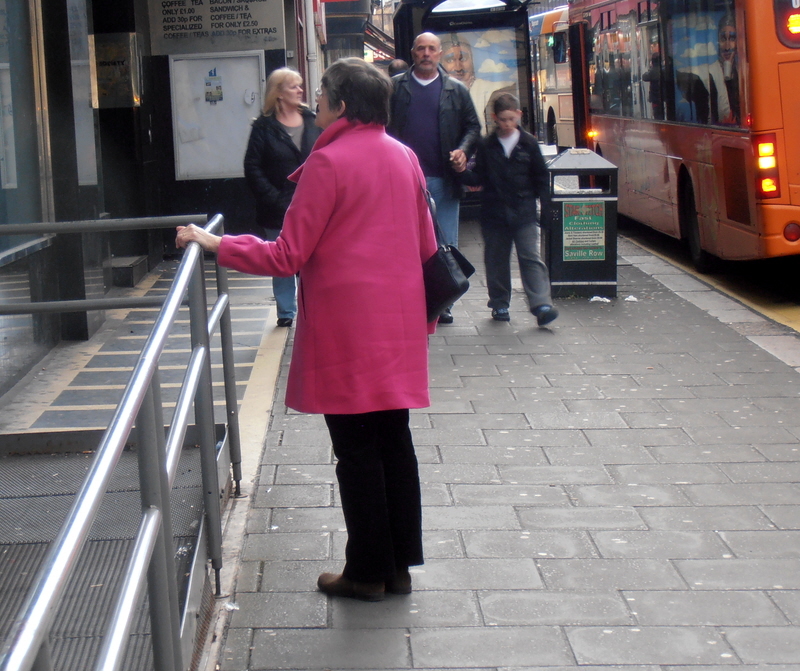 Mrs Tootlepedal added a splash of colour to the streets. 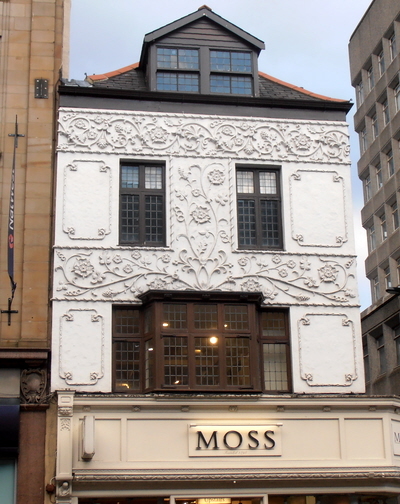 She was struck by this example of pargeting in the pedestrian precint near the monument. After our shopping, eating and wandering, we just had time to dash into an art gallery and enjoy a quick burst of culture for 15 minutes before we got down to the main business of the day which was going to see the much praised film, “The Artist”. It was being shown in a wonderfully old fashioned cinema with a balcony in which we sat. We enjoyed the film but thought that it didn’t deserve the huge amount of hype it has had. 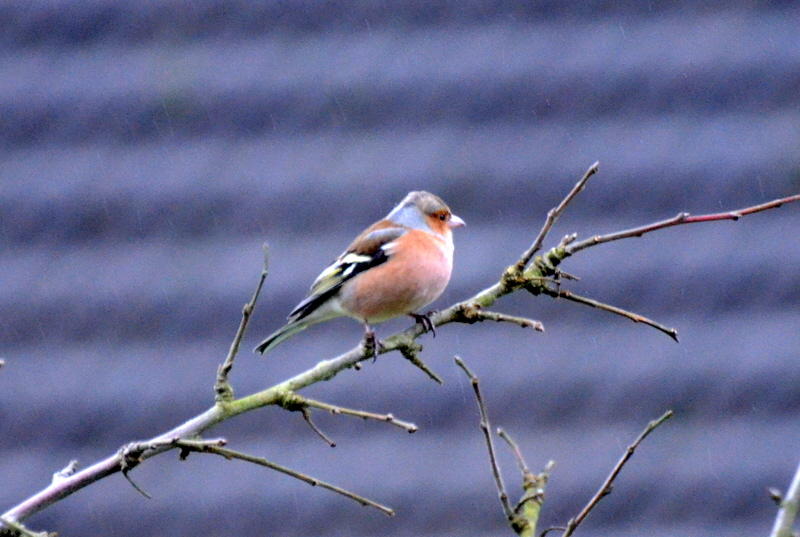 We were pleased to have seen it though, if only for the top notch acting of the star of the show. We came out of the cinema and walked down to the station in perfect time to catch the train back to Hexham and this rounded off an excellent outing to Newcastle. The pleasures of the day had not finished yet though as we got into conversation with a bloke in the next seat to us on the train and it turned out that he knew our daughter Annie, having lived four years ago in the same street in London as she did. There is nothing like a thoroughgoing off the wall coincidence like that to make you feel good and we got out of the train at Hexham feeling very cheerful indeed. Then we made things even better by having a quick trawl round a Waitrose Store near the station where we were able to buy several nice eatables which are not readily available to us poor people in the south of Scotland. An easy drive home rounded things off nicely and now we are looking forward to next year’s anniversary already. There is just the small matter of finding out what is wrong with the car looming on the horizon. As the garage only serviced the car last week, we are hoping that they will be as keen to find out what went wrong as we are.